UNCASVILLE - Chris Polo isn't asked to be one of the primary scoring threats on the Valley Regional of Deep River boys' basketball team. Polo sure picked his spots well during Friday's CIAC Class M championship. The senior scored all 12 of his points in the second half and added a game-high 15 rebounds as the fifth-seeded Warriors beat No. 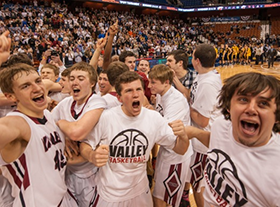 23 Weston Friday, 52-45, to win the their second state title in three seasons before 3,874 at Mohegan Sun Arena. "I just try to make what I can," Polo said. "I don't shoot a lot, so whenever I shot, the ball has to go in." Valley head coach Kevin Woods said, "I challenged him (at halftime) to step up and play a great second half, and boy, did he ever. It seemed like every time (Weston) made a big shot, Polo would answer some way, some how." Chris Connor had 12 points and eight rebounds and Chris Jean-Pierre added 10 points for the Warriors (26-2). 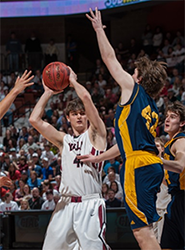 Senior Charlie DiPasquale had a game-high 24 points and junior Ashler Lee-Tyson scored 11 for the Trojans (14-12). They began the tournament with a losing record, but knocked out three higher seeds to get to the final. "I couldn't be more proud of my guys," Weston coach Mike Hvizdo said. "No one would've ever thought this program and these kids would be playing in the championship at Mohegan Sun. We exceed everybody's expectations times 10." Polo's tip-in off a Jon Luster miss cut the Trojans' lead to 29-28 with over four minutes left in the third quarter. Jean-Pierre followed with a 3-pointer to give Valley the lead. Luster added a layup in transition. A 3-pointer by Cunningham off Luster's offensive rebound pushed the Warriors' ahead, 36-29, with one minute, three seconds left in the period. Polo's 3-pointer gave Valley a 39-32 lead with over five minutes left in the game. "Only the second one of the season," Polo laughed. "We all know he can shoot that shot," Woods smiled. "We don't ask him to shoot too many. We have plenty of those guys." Cunningham followed with a steal and layup in transition to push Valley's ahead 41-32, it's biggest lead of the game. "They're all seniors," Hvizdo said of the Warriors. "They played on this floor two years ago. They have that experience. They made some big shots in the third quarter and we missed some good shots. It's really that simple. The better team won tonight." Technical fouls: Weston-None. Valley Regional-None.